This is crossposted from my Timeless Isle thread. This is my attempt to make sense of that information, limited as it is. Discuss my efforts and your own ideas! Go! All the Spirit Tamers' pets have been re-added, which confused me as I didn't recognise their names off hand. The fact that these all have Honorifics cannot be a coincidence, and there is one of each pet family! Apparently the same as the other trainers' pets listed above, but with a low NPC ID, and no leftover trainers to assign him to. Maybe a pet that belongs to a trainer on the Timeless Isle outside of the scenario? Interestingly uses the same model as the Perky Pug. There is an NPC called Muffin on Live servers. He is a dog that wanders about in the Shrine of Two Moons, although he does not use the Perky Pug model, and is currently classified as a Humanoid. 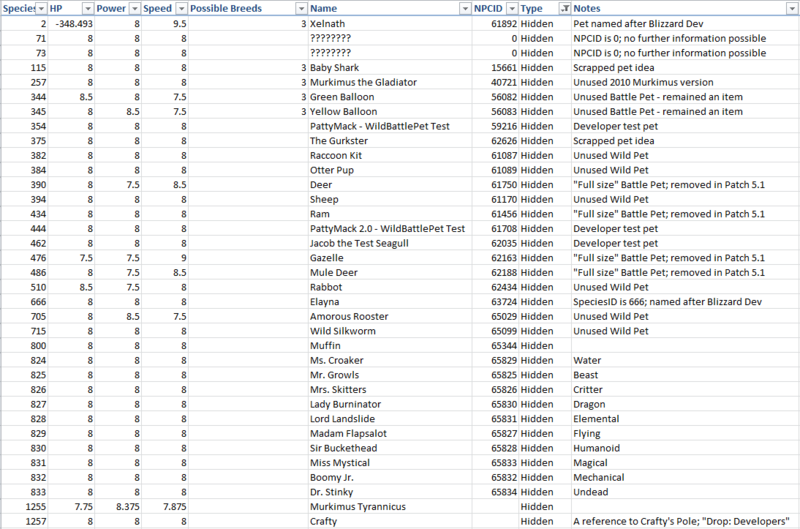 I think it is likely that this is the same NPC updated to be categorised correctly. The only apparently catchable pet included in the July 2nd update, with the flavor text: "Elayna is found only within snowstorms and can usually be found by luring her out with a notepad and promises of Wiki pages." Shares a model with the Magical Crawdad. An elite pet, non-catchable. Similar to Doopy in Icecrown, perhaps? The model is a bear and the quality is currently poor, whereas Doopy is Legendary. Again, the NPC ID is too low to associate it with the scenario trainers, and the "Elite" status rules it out anyway. Last edited by Jadax on July 12th, 2013, 9:12 am, edited 3 times in total. Perhaps a new chapter of the Beasts of Fable? Those pets are the names of the Spirit trainers pets already. So nothing new afaik. I knew I recognised Darnak the Tunneler. And best of all, a Lil' Deathwing model pet called Dah'da. Both of Taran Zhu's pets are Humanoid pandas. Blingtron's "Au" seems to be a new Elemental model, made of gold. Chen's "Brewly" is an Alemental, like in the Stormstout Brewery. Dr Ion's "Screamer" probably uses the hatchling skyscreamer model, as it's icon is the same as the Pterrordax Hatchling, but the model is unique. I wonder how it is going to play out though. if there are 10ish pet tamers on the timeless island ( bing, chen etc).. Are they going to all be new dailies? I do all the pet dailies now that can reward the battlestones.. but 10 more per day will be a bit much. Even with alts spread all over pandaria it still takes a couple hours. I guess the good news (for me at least) is that hopefully before 5.4 I may be done needing battle-stones. One possibility is the ´honor´ pets you listed are possible rewards for these 10 new pet dailies, similar to the 4 pandas and the elementals. It is neat to see the pets and tamers being added, but I am much more curious about the progression part of it. Azrile wrote: This is neat information. The tamers listed are all part of the Celestial Tournament scenario. No one knows exactly how it will play out just yet. 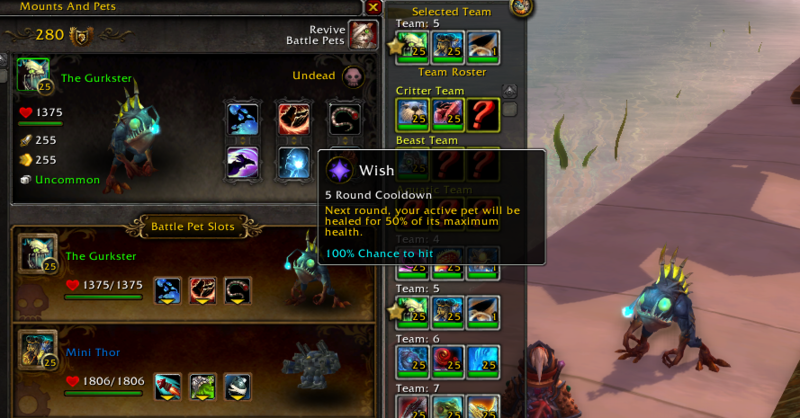 I do not think that the pets with honorifics are catchable, as they are explicitly unable to battle, which is odd for pets that aren't inanimate/playable races. Shame they don't seem to be taking this opportunity to use the Lil Alexstrasza model (for the Alex pet Wrathion is using). Yet, anyway. Socks as undead have no sense. He was 'jaded', not killed, and the questline shows it is reversible effect. He would fit as Magic more, with Gizmo as undead. I'm happy with some humanoid tamers, finally can use Undead pets without getting slaughtered by tons on critters and aquatics.